The Roselle Catholic community was saddened to learn that Edward "Eddie" Sisk, Class of 1975, Patriarch of Elizabeth's fire department as second-generation fire chief, RC Board Member and leading figure in Roselle Catholic and Irish-American circles and youth sports coach, passed away on Wednesday, July 26, 2017 at age 60. 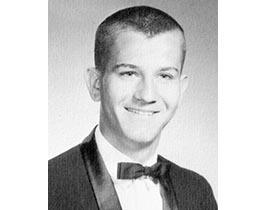 When I first heard the very shocking and sad news that Ed Sisk of the Class of 1975 had suddenly left us, my immediate thought of Ed was, “his devotion to Roselle Catholic was matchless.” It took only a minute before I realized that RC was not the only fortunate recipient of Ed’s dedication and devotion. Ed had an extraordinarily wide orbit that he brought his boundless energy, commitment and enthusiasm to bear. First and foremost Ed was devoted to his family, wife Helen, and their three children, Edward, Nicholas and Erin, all RC alumni. 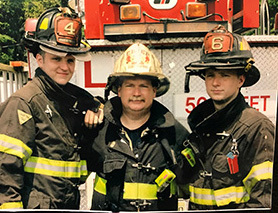 Ed was devoted to the Elizabeth Fire Department, which he joined in 1980, rising through the ranks, following his father’s legacy to become its Chief in 2003, before retiring in 2010. It’s an understatement to say Ed was a man of many passions. He was a dedicated board member at Roselle Catholic, an active volunteer in the RC community, running fundraisers, and coaching girls' softball from 2003 to 2015. In September of 2011, as RC Board Chair at the time, I asked Ed to join the board. It was here that I saw first hand the devotion and work ethic that was part of Ed’s DNA. Ed was not satisfied just coming to Board meetings. He had to be involved. He volunteered. He did the heavy lifting! 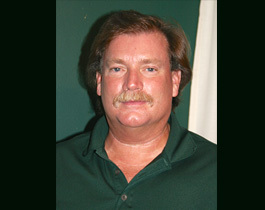 In addition to his coaching RC Girls softball for 12-years, he brought his ceaseless energy to the Board’s Physical Plant & Campus Safety committee and its many projects, as well as organizing the RC Saint Patrick's Day Dance. Ed was also a dedicated parishioner to St. Genevieve's in Elizabeth and active member of the Knights of Columbus. Upon retirement, Ed continued his dedication to civil service as a contractor and subject matter expert for the N.J. Civil Service Commission. In addition to his memorable career with the EFD, Ed led a life dedicated to volunteerism in the community. He was an active volunteer with youth sport programs with Saint Adalbert's, Saint John the Apostle, North Elizabeth Little League, and Elmora Youth League. Ed found great joy in combining his Irish heritage with his desire to give back. He was a past president of The Friendly Sons of Saint Patrick of Union County and was named the Union County Saint Patrick's Day Parade's Distinguished Serviceman of the Year. Ed, Girls softball coach, far right, with other RC coaches. Ed was instrumental in coordinating the Elizabeth Fire Department's mutual aid response to New York City following the 9/11 attack. He was a past president of Elizabeth IAFF Fire Officers Local 2040. Gene Chrzanowski, Georgetown Law School graduate, Air Force JAG officer, lawyer, and lately, Sport Fishing Charter Boat Captain in Key West, Passed Away Tuesday, May 9. Many at the point when reflecting on their life look back with regret on unfulfilled dreams. Not Gene. He left a successful, high profile legal career of 29 years to become one of the top, most respected and beloved sport fishing charter boat captains in Key West. His profession and lust for life kept him fit, active and young in spirit, right to the end. In 2012 I had the privilege, as I have had with so many RC alumni, to interview Captain Gene Chrzanowski, class of 1966, for a feature in the RC alumni magazine, THE LION. In the published article I wrote: “He (Gene) has led a life straight out of a Jimmy Buffett song, and a Key West lifestyle that even Jimmy would envy!” Well, Gene personified the lyrics of another Buffett tune, the title of which is, “I’d Rather Die While I'm Living, Than Live While I'm Dead." And boy did he live — and with no regrets —- even when enduring a bout of cancer that started with his prostate and spread aggressively and rapidly. In addition to his charter sport fishing operation, Captain Gene regularly provided Key West offshore fishing reports for a local radio station and did a monthly article for a local magazine -- a talented writer, his articles appeared in FishMonster Magazine. In his October 2012 piece, he wrote: “Today I consider myself the luckiest man on the face of the earth.” Those were the famous words uttered by Hall of Famer Lou Gehrig the day he was honored at Yankee Stadium. However, Gene uttered those same words everyday for the past 15 years. The life and career path of Gene Chrzanowski was unusual, to say the least. After Roselle Catholic, he graduated from Holy Cross, then on to Georgetown Law School. Gene passed three full bar exams - D.C, Virginia and California - all on the first attempt. He served in the US Air Force Reserves after law school from 1973 to 1976, as a Legal Assistance Officer, with the rank of 1st Lieutenant. Gene then practiced law for 29 years in those three places and walked away from high status and high paying jobs four times just for personal satisfaction reasons. However, the one exam he was most passionate about passing was his charter boat captain’s license. My heart sank when I received the news that Captain Gene had passed. While I knew how this was going to end, I wanted to believe it was not reality. I was buoyed by knowing that just two days earlier, in typical Gene Chrzanowki style, he had the rare opportunity to attend hos own “going away party” hosted by his many, many friends. It also helped going through the many photos on his boat’s Facebook page to see Gene in his bigger than life, life! Since I connected with Gene for the article, I may have unconsciously lived vicariously through him. Maybe he's why I moved to an island in the “lower latitudes” -- certainly not one that's up to his standard or lifestyle. Yet one thing has resonated with me from my connection with Gene, his island life-style aside, is he learned over time what made him happy. He listened to his inner voice and realized what pursuits he did and did not enjoy -- all to get to a point where he definitively knew, without second-guessing or regrets, what made him happy in life. That is a trait to which too few can lay claim and a legacy that is all his. Back when I asked him about his "favorite quotation" it led Gene to a connection from his RC days.